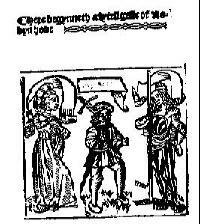 In 1560, William Copeland printed the fragments of the various Robin Hood folk dramas. The “plays” were likely performed by mummers and strolling players for a century or more before Copeland printed them. A Gest of Roby Hode has been known by a variety of of titles. It is one of the earliest Robin Hood stories, likely written in the late 1400s. It is about 14,000 words in length. A “gest,” according to Dictionary.com, means a tale of adventures; especially : a romance in verse; an adventure, exploit, or knightly gests. Bold Outlaw breaks down the “fyttes” as follows: “The Gest is divided into eight sections, known as Fyttes. Here’s a breakdown of the main action…. “Fytte 1 — Robin wants to have a guest before they eat. Little John finds a poor knight in threadbare clothing. The knight’s son killed someone in a joust and the knight had to borrow 400 pounds from St. Mary’s Abbey, York to pay the bail. Now, the loan is due, and the knight doesn’t have the money and will lose his lands. Finding him to be honest, Robin loans him the money and gives him fine clothing. He sends Little John along with the knight. “Fytte 2 — The abbot of St. Mary’s and others are eager to seize the knight’s land. The knight shows up and pretends to be broke. They show no mercy. And therefore, when the knight pays up he doesn’t give them a tip. The knight returns home, collects the money, and makes a gift of fine bows and arrows, to repay Robin. On his way to Barnsdale (Robin’s base), he is delayed to help a yeoman in a wrestling match. “Fytte 3 — Meanwhile, Little John goes to Nottingham and enters an archery contest. The sheriff is impressed and drafts Little John into his service. After spending some months with the sheriff, Little John causes trouble, fights and recruits the sheriff’s cook and they make off with the sheriff’s treasure. Later, they lure the sheriff into meeting Robin Hood. In exchange for his freedom, the sheriff promises not to harm Robin. “Fytte 4 — Waiting for the knight to return his loan, Robin and his men intercept the high cellarer of St. Mary’s abbey. The monk is rude and dishonest, and so Robin robs him of 800 pounds, claiming the virgin Mary has sent this payment. When the knight does show up, Robin gives him another 400 pounds. “Fytte 5 — The Sheriff of Nottingham holds an archery contest for a gold and silver arrow. Robin wins the contest. But his men are ambushed, Little John is wounded, and they take refuge at the castle of the knight (now called Sir Richard at the Lee). “Fytte 6 — The sheriff goes to the king for help, and returns to capture Sir Richard. Sir Richard’s wife goes to Robin for help. Robin rescues the knight, kills the sheriff and flees to the forest. “Fytte 7 — Planning to deal with Robin personally, the king goes to the forest disguised as an abbot. He makes friends with Robin. They have an archery contest which Robin loses. The knight discovers the king’s true identity. Robin enters the king’s service. As one can easily assume, latter ballads are based on the Gest. Bold Outlaw goes on to say, “Historians, such as John Bellamy, continue to focus on the Gest in their attempts to find an original Robin Hood. The description of Robin’s Yorkshire haunts is unusually specific. (Sherwood Forest is never mentioned in the Gest.) There is much debate about when the story is set. “And there’s much debate over which Edward the king is meant to be. In the early 19th century, Joseph Hunter found the king’s journey in the Gest is similar to that of Edward II’s. There was even a Robyn Hood serving as a porter in this king’s court. However, other details point to the reign of Edward III. 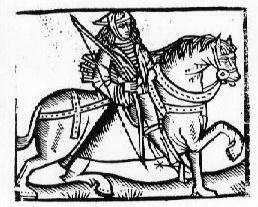 Professor Stephen Knight stated in his 1994 study of Robin Hood that the king may have been Edward IV, who was likely the king at the time of composition. — A Book of Medieval Outlaws: Ten Tales in Modern English, edited by Thomas H. Ohlgren, p. 111. This entry was posted in ballads, British history, Canterbury tales, drama, literature, Uncategorized and tagged ballads, British history, Child ballads, Gest of Robyn Hood, literature, Robin Hood. Bookmark the permalink.